Do you remember the photo I took two days ago, when I told you I would let you know later where I was when I took it? 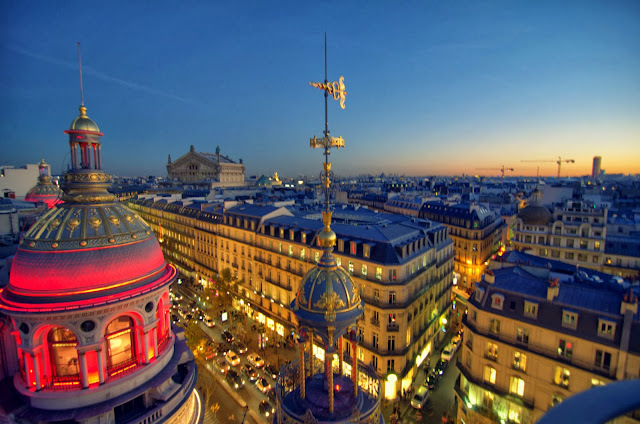 Well, I was on the roof top of le Printemps, the large department store located on boulevard Haussmann. It's a wonderful location where everybody can go - it's free - and even have a drink while looking at the stunning view - they also have a little café up there. It only takes 5 minutes to go up the 8th floors (with the elevator) and it's worth it day and night (providing there is no fog of course!!). I love this! I wish I had known of this place when I was there in Sept. It looks like a scene from a fairy tale. I am imagining next year's calendar: From the rooftops of Paris. Although, you have some great ones from ground level. Maybe alternate the photos? It's wonderful! What's inside the red cupola? What a fabulous view (and photo)! I do love viewing the city from this high perch... love the colors and that vibrant sunset. I have about 200 sunset photos taken from the rooftop of GL. That is a grand view! This photo literally took my breath away! Stunning! This is going towards the top of my "to-experience" list for my next trip to Paris. Thank you! Thanks for the tip! Absolute magic! Love the colors. Looks like some "tall" construction is still underway in the City of Light. Sorry, I saw this yesterday but passed out from the spectacularity and only just regained consciousness. It's gorgeous, Eric.